While fancy coloured diamonds have been making the news for fetching record prices at auctions in recent years, they still remain rather mysterious to many jewellery lovers. We shed some light on their rise in popularity, and the basics of buying them. If white diamonds are a girl’s best friends, then fancy coloured ones must be her closest confidantes—for they are the rarest of the rare in the world of gemstones, and way more expensive and treasured than their white cousins. In fact, out of every 10,000 gem-quality diamonds, only one has a fancy colour. Estimates put fancy coloured polished diamonds at one in 10,000, and 1 in 25,000 exhibits a fancy intense colour. A fancy intense blue diamond, which is more valuable than yellows or even pinks, is one in 30 million diamonds. In addition to this incredible rarity, there are a host of contributing factors that play a key role in the current surge in interest in coloured diamonds and their tremendous value today. More widely available and attractively priced are fancy yellow diamonds, featured strongly in Tiffany & Co’s collections, including the Keys range. Few gemstones in history were so iconic, rare and beautiful that they were given a name, and fancy coloured diamonds feature dominantly in this pantheon of greats. You might have heard of the world’s most famous, and infamous, diamond: the 45.52-carat fancy dark greyish-blue Hope Diamond, first purchased from Cartier by American heiress Evalyn Walsh McLean in 1910, and is now displayed at the Smithsonian National Museum of Natural History. When Evalyn Walsh McLean bought the Hope Diamond from Cartier in 1911, it came mounted in a pendant surrounded by diamonds, and suspended from a diamond chain. A legendary yellow is the 101.29-carat fancy vivid yellow Allnatt Diamond, which was discovered in a South African mine around 1880. Its first known owner, English businessman Major Alfred Ernest Allnatt, entrusted it to Cartier in the early 1950s to be set into a brooch. One coloured that is considered priceless is the largest and finest green diamond ever found, the 40.7-carat Dresden Green, which dates back to the 1700s and is now displayed at the Albertinum museum in Dresden, the capital city of Saxony in Germany where it derived its name. Étourdissant Cartier high jewellery ring, featuring a 3.45-carat fancy vivid blue diamond as the centre stone. Other well-known gems include the extremely rare 5.11-carat Moussaieff Red; the massive 59.6-carat Pink Star (formerly known as the Steinmetz Pink); and a 14.82-carat orange diamond, believed to be the world’s largest in that colour, simply named The Orange. While fancy coloured diamonds have always been prized through the centuries, several high-profile, record-shattering sales of top diamonds in the past few years have again thrust this small group of gems into the limelight. The largest fancy vivid blue diamond to appear at auction, the 14.62-carat Oppenheimer Blue sold for a record-breaking $57.5m at Christie’s in Geneva in May. 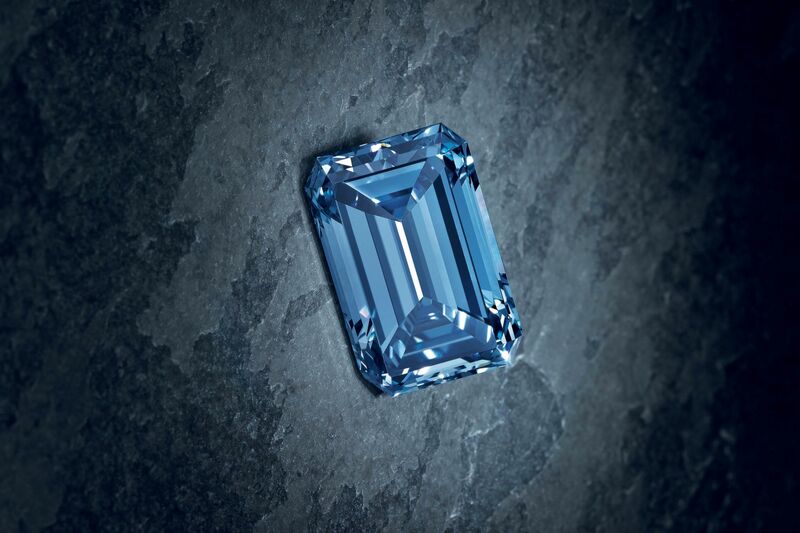 Last November, Hong Kong billionaire Joseph Lau paid US$48.4m for a 12.03-carat fancy vivid blue diamond at a Sotheby’s auction in Geneva for his daughter, and named it the Blue Moon of Josephine after her. It was the most expensive diamond ever sold, regardless of colour, and fetched the highest per carat price. The previous day, he had spent US$28.5m on a 16.08-carat fancy vivid pink diamond auctioned by Christie’s, and called it Sweet Josephine. The previous world record for the most expensive diamond was held by the 24.78-carat fancy intense Graff Pink diamond, sold in 2010 at Sotheby’s, for US$46.2m to London jewellery dealer Laurence Graff. Far exceeding estimates is this ring set with a 4.08-carat fancy vivid orange diamond, which sold for HK$19.28m at Sotheby’s Hong Kong auction in April. If you are wondering why it seems that fancy coloured diamonds seem to be more pervasive now than ever, it’s a simple case of supply rising to meet demand. The Aurora Green, which was up for sale at Christie’s in Hong Kong in May, is the largest natural fancy vivid green diamond in the world at 5.03 carats. The auction house experts are reluctant to discuss pricing of top-quality, large fancy coloured diamonds, for these are so rare that each one has to be judged on its own grading and merits. Sotheby’s Quek says prices of important blue diamonds sold at auctions have doubled over the past three to four years, but adds that top diamonds of other rare colours like pink, orange or green offered at auctions have been so few and varied in size and shape that it is impossible to chart price trends. In general, for “normal” fancy coloured diamonds, Tilani estimates that the yellows and browns have appreciated very slightly over the last decade, while pinks and blues are commanding skyrocketing prices. Apart from the rarity of fancy coloureds driving their investment returns and therefore demand, Quek also brings up the aesthetic rewards of owning and wearing something one-of-a-kind, and the emotional significance of buying it to commemorate a key event: “the yield in this respect is quite different from that of an investment portfolio’s”. Sold for US$31.8m at a Sotheby’s Hong Kong auction in April, this 10.10-carat fancy vivid blue De Beers Millennium Jewel 4 set the record for the highest price ever paid for a jewel at an Asian auction. Fancy coloured diamonds hail from Australia, Brazil, South Africa, India, Canada, Russia, several African nations, and even Borneo. White diamonds are colourless to light yellow, and described based on the industry’s D-to-Z colour-grading scale. Beyond Z, the yellow diamonds are considered fancy coloured diamonds, as well as diamonds that display any other colour face up. Although pinks and blues seem to be favourites, red, green, purple and orange are rarer, while colours like brown, black and grey are also fancy colours. The value of white diamonds in the D-to-Z range usually decreases as the yellow becomes more obvious, but the opposite is true for fancy coloured diamonds: the more intense the colour, the more valuable. The historic Allnatt Diamond, which was discovered in a South African mine, was named after its first known owner Major Alfred Ernest Allnatt, who owned it during the 1950s. In assessing fancy coloured diamonds, Far East Gem’s Tay says that the standard 4Cs are also used, although the information is interpreted slightly differently. “The rarer the colour, the lower the carat size you would expect. For pinks, you would generally see 0.2 to 0.7 carats, and even then a 0.2-carat pink is impressive. The extremely rare 15.38-carat Unique Pink sold for US$31.6m at Sotheby’s in Geneva in May, earning it the honour as the most expensive fancy vivid pink diamond ever sold.